Today it’s time for the 18th installment of Conner’s Closet!!! I can’t believe we’ve been doing this for a year and a half now. Thank you Conner for all of the incredible WORK WEAR ideas that everybody gets so excited to see every month! And I’ve got some great news. EVERYTHING she’s featuring in today’s post is AT LEAST 40% OFF. 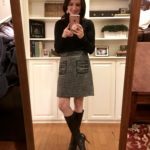 This is officially my favorite fall outfit! I love everything about it…the colors, the texture, the tie, and the pockets (yes, pockets). 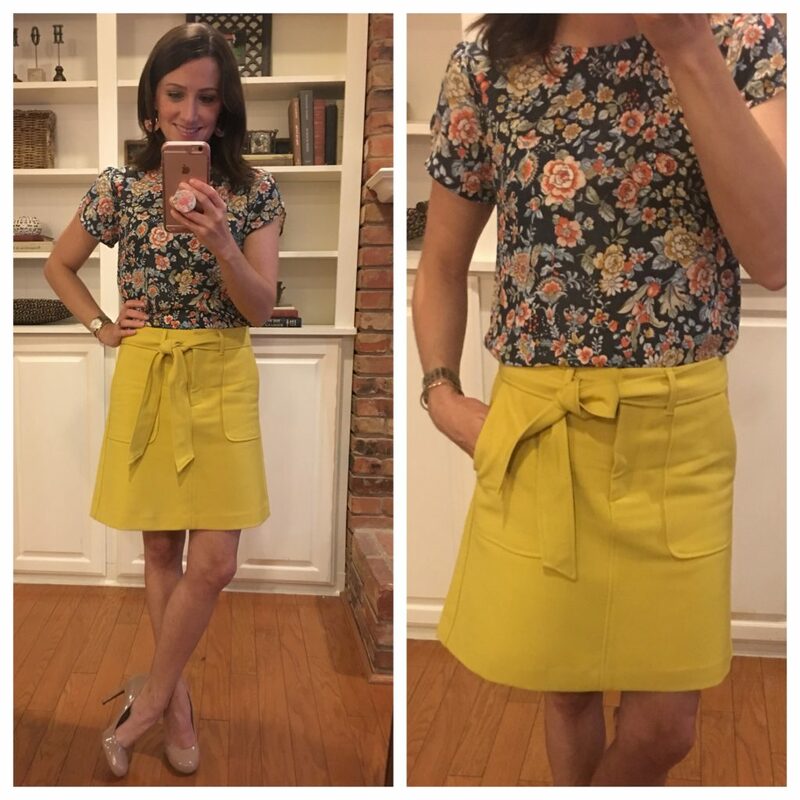 I LOVE the color yellow and knew this skirt (ON SALE and an additional 40% OFF) had to be mine as soon as I saw it. One reviewer says it is more of a green yellow, but it’s definitely marigold…she needs to have her eyes checked. Ha! 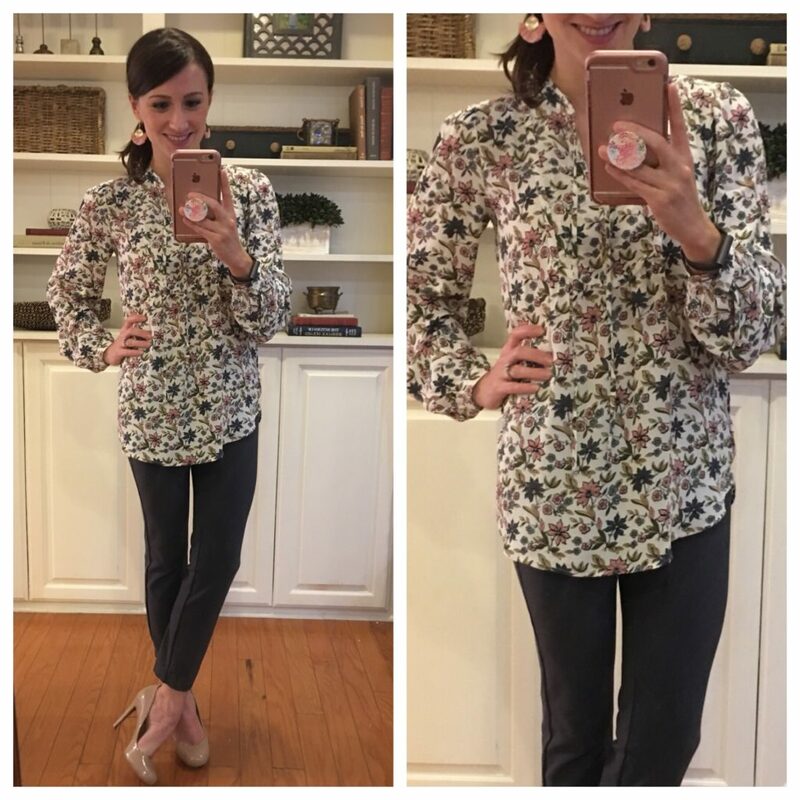 There is just a hint of yellow in the floral button back top (ON SALE…and an additional 40% OFF right now!) 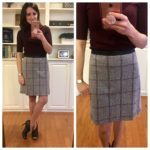 – it’s perfect with the skirt! The skirt is long enough to wear with heels, but it would also be super cute with flats! It will also look great with this navy and white striped top or this other floral blouse. And you need to be sure to add the Raffia Drop Earrings (ON SALE and an additional 40% OFF!) to your cart, too. 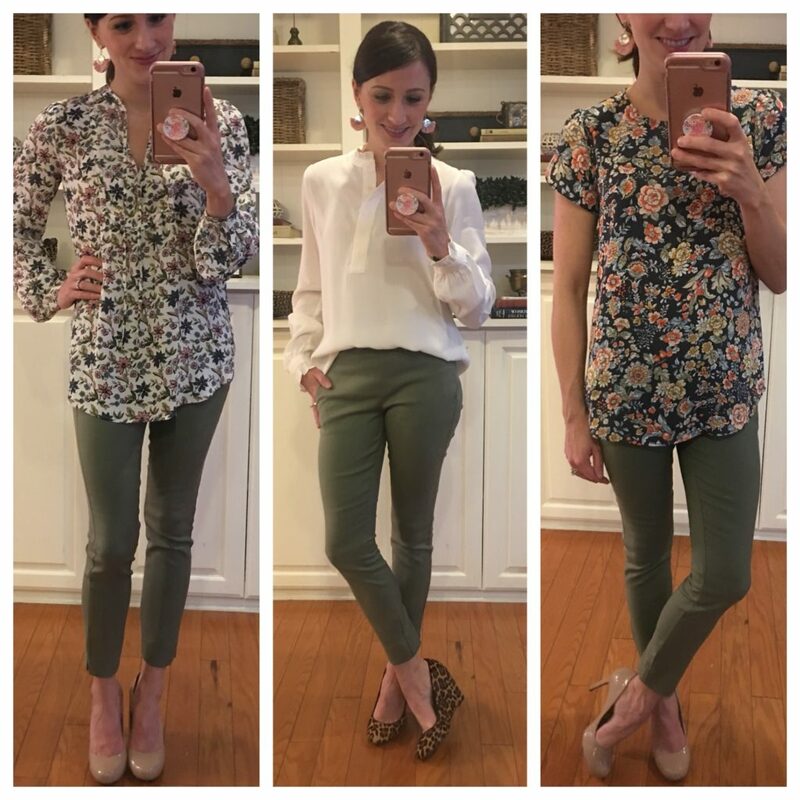 I hope you like them, because I am wearing them with all three outfits! The fit is consistent with my usual Loft sizing. The top is an XXS regular and the skirt is a 00 petite. The top is machine washable, but I will take the skirt to the dry cleaners. Ok – so let’s do a quick recap. What did we learn today? Buy the yellow skirt. Buy at least 2 tops to go with it. Then, be prepared to get a ton of compliments. SERIOUSLY DARLING, sister! AND ALL ON SALE!!! I loved the print of this top (ON SALE and an additional 40% OFF! ), and it comes in plus size too (also on sale!). 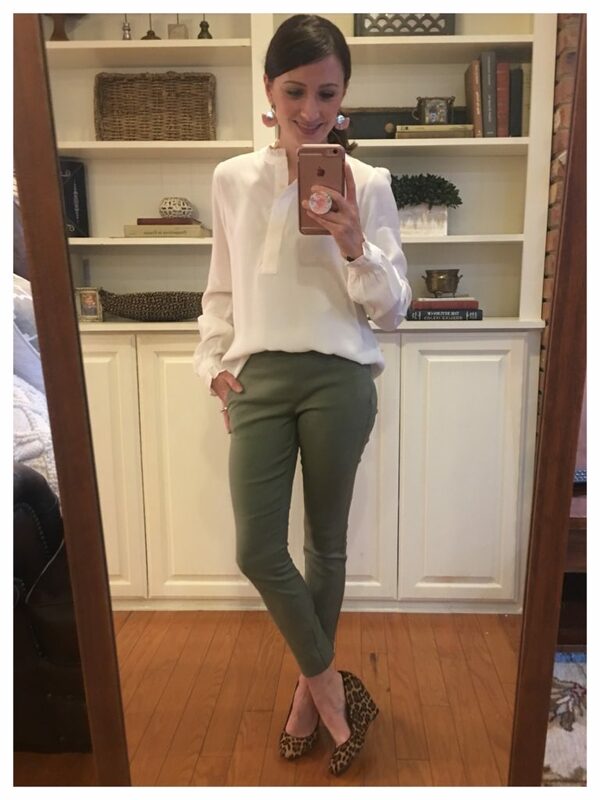 I knew it would pair perfectly with the Marisa pants in coastal grey (40% OFF).What I didn’t know is that it would also look fantastic with the olive green pants, too. It’s pretty, comfortable, and will also look great with dark, skinny jeans. I can’t say enough about the Marisa pants (click HERE for all Marisa pants). I have a pair in every color and wear them at least twice a week! These pants are such a great staple and you won’t regret buying a pair…or two, or three, or four. Trust me! Also, did you notice the Raffia Drop Earrings again? Have I convinced you to get a pair?!? The top (XXS regular) and the pants (00 petite) are true to Loft sizing. Both are machine washable, but I will lay them flat to dry. This is an awesome outfit too, Conner! This top is so pretty, and I’m in 100% agreement that the Marisa pants are the best pants out there! I have several pairs as well from the last several years (black, navy, red, and orange). I absolutely love this outfit, but the pictures don’t do it justice. The white, green, and pink (in the earrings) color combination is perfection! This blouse (40% OFF) is to DIE for. The ruffle stand collar, button cuffs, and gathered back are so feminine. I believe these pants (40% OFF!) are new to Loft and let me tell you, I’m a fan. Right now, they only have them in green and black, but believe you me, I’m going to lobby for them to make them in every color. The pants have side slits and also zip on the side. I love the white, pink, and green combo too….AND THE ADDITION OF THE LEOPARD SHOES WAS SO SMART. Such a great loook! Since Conner’s shoes are old, I wanted to give y’all some options! If you’ve been reading here for awhile, you know I’m a big fan of a leopard shoe. Personally, I own these flats (I’ve had them for about 4 years and still wear them all the time! ), these slides, and these booties. 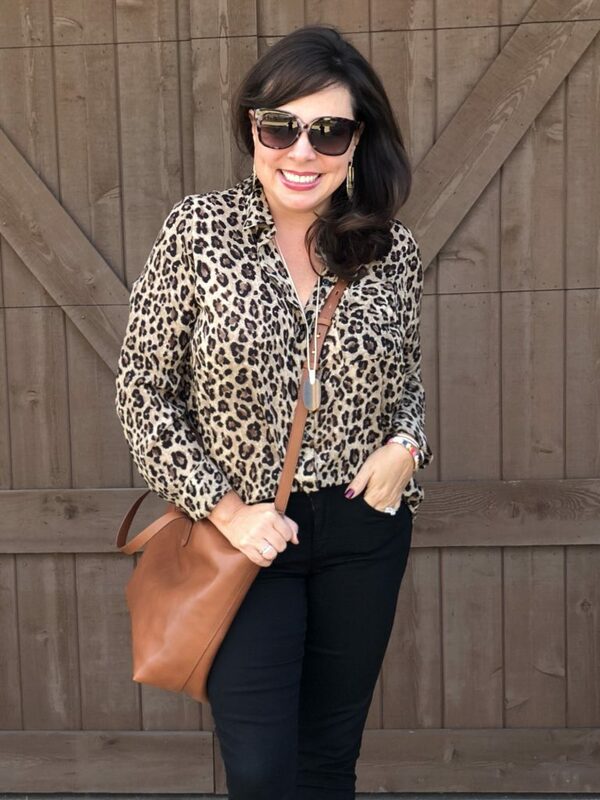 I don’t have a need for leopard heels because I just don’t wear heels often at all, but if I did have a need for them, I think I would go for #4…..although I’m kind of dying over #3. AND JUST FYI, NORDSTROM TRIPLE POINTS STARTED TODAY! WOOOOOHOOOOO! And check out the versatility of the green pants! Here they are with all 3 blouses previously seen above. Your outfits are all DARLING, and I know there are lots of working women out there who appreciate these posts so much! Now, before you go, I’ve got a couple of things for all of you! This top is one of the stars of the post, but tons of other bloggers are showing it this week and I’m afraid it’s going to sell out before Friday! It’s ONLY $49, and it’s TOTALLY CHIC. It reminds me of a Veronica Beard blouse, but it’s a fraction of the price. It looks much more expensive than it is. I will wear this top with black jeans, regular denim, and white jeans. And going along with the WORK WEAR theme, it would also look awesome with black pants or a pencil skirt. THIS IS A GREAT BLOUSE. LOOK HOW CHIC IT IS! Secondly, I want to make sure you know about the HUGE MAKE UP SALE happening right now (along with TRIPLE POINTS!). As you know, make up rarely goes on sale, so I try to take advantage when it does. 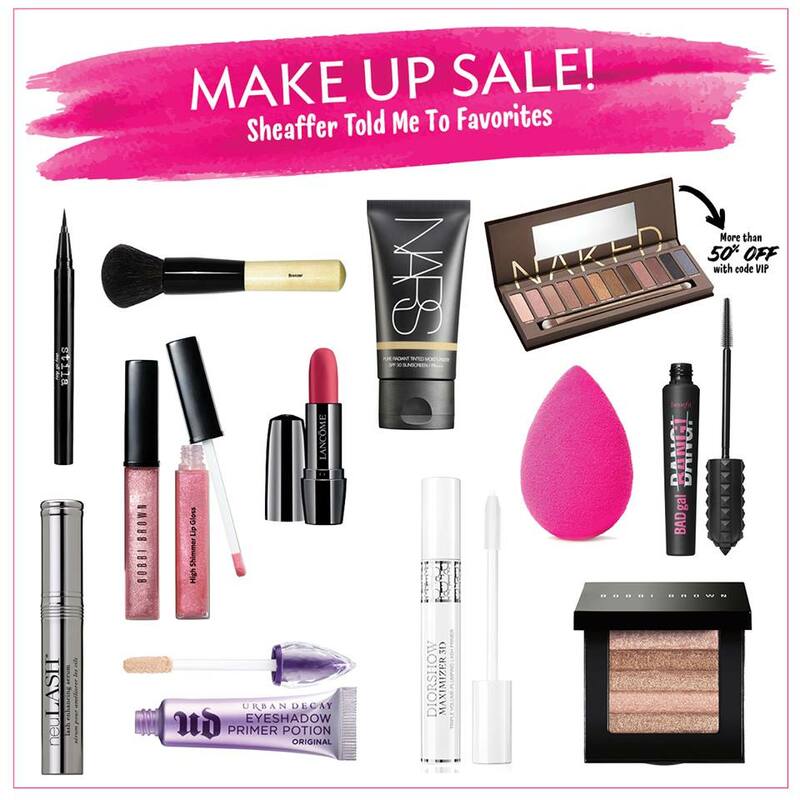 Click HERE for all of the make up included in the sale (NARS, MAC, Clinique, Lancome, Stila, Smashbox, Bobbi Brown, etc…). My favorites are in the collage below. The eyeliner is the best eyeliner I’ve ever used, and I know I’ve converted many of you. The black is too stark for me, so I wear the “alloy” which is a wonderful grey. I use all of the products you see below every single time I put on make up. They are my tried and true favorites. Well, the mascara is new, but I’ve always had trouble finding a mascara I swear by, and this one is good so far. I get asked all the time for my favorite blush, and my favorite is actually “Classic Pink” by Cover Girl! However, I know that this blush is like the most popular blush EVER and supposedly works on pretty much every skin tone. 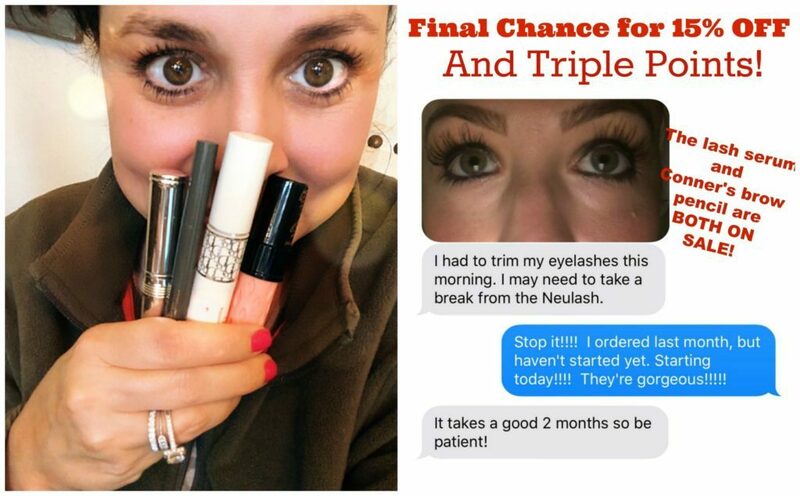 And in anticipation of questions I will receive about the Nuelash, it’s a serum that helps grow your lashes. I’ve had good results, but my sister has had PHENOMENAL results. That’s me on the left and her on the right (in a text she sent me last year). I also swear by the Dior lash extender and put it on right before I put on my mascara. It lengthens my lashes with white fibers, but they don’t fall off into my eyes. It’s pretty magical. If you have a make-up favorite that you CANNOT LIVE WITHOUT, and you think I need to know about it, please leave it in the comments! I’ve been wanting to try some new products, and this sale is the perfect opportunity. One more thing! 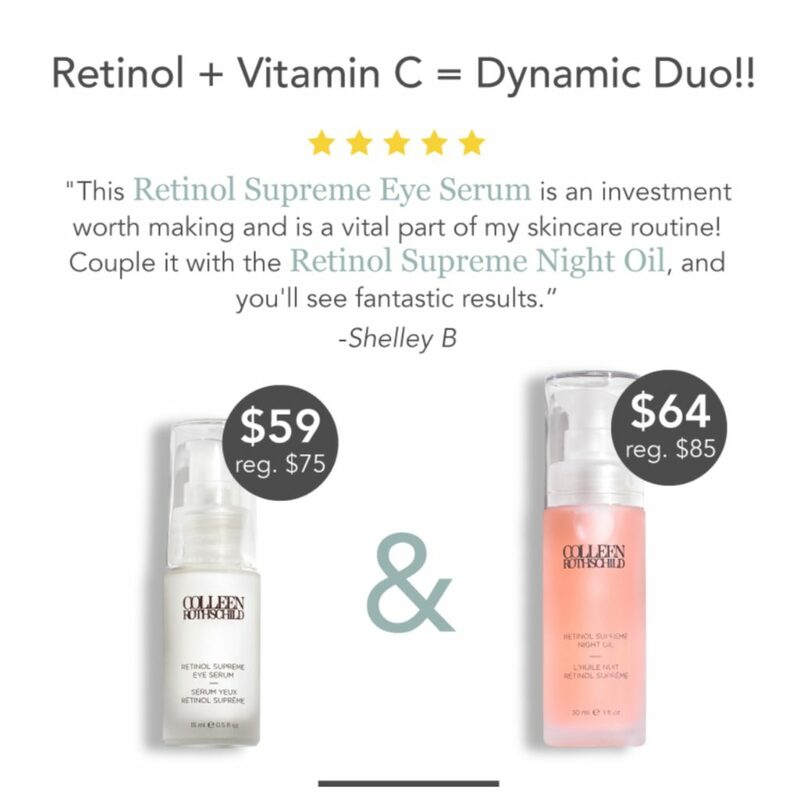 Colleen Rothschild is having a flash sale on two of her Retinol products. Click HERE! And I’m telling you. GO READ THE REVIEWS. See y’all back here on Friday! 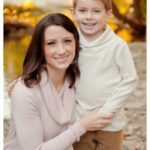 I have a post that I am SUPER EXCITED about!!! 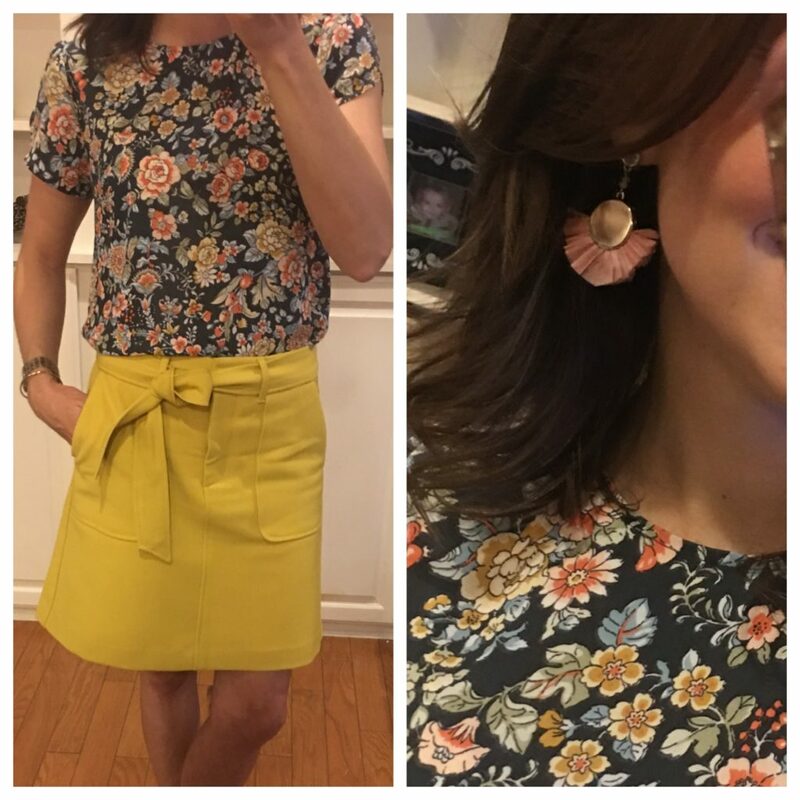 I never knew I wanted a yellow skirt until this post. That outfit is darling!! Oh my stars!!! 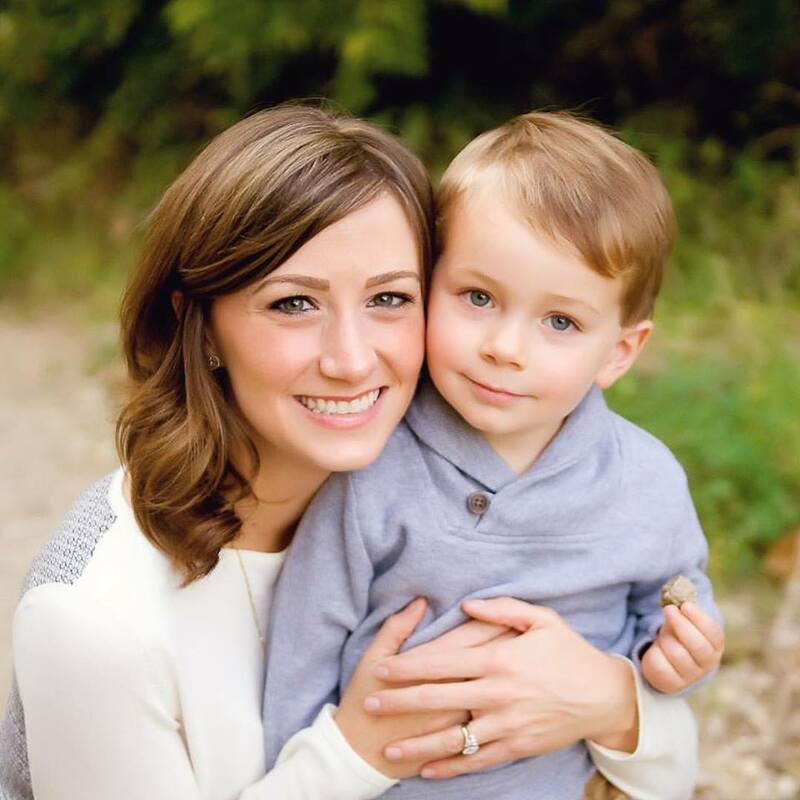 Conner is adorable! She makes me want to work in an office stat! Off to shop for that darling skirt! So fun! These are some of my favorite posts! Conner has such a knack for putting an outfit together!! Hi Sheaffer- I am a mascara snob. I don’t take my eyelashes lightly. I have tried many different high end and drug store brands. I always come back to clinic high lengths mascara. I think it’s the wand that makes it amazing. It is thin enough that I can also Att the application very close to my eye without poking my eyeball. I buy this stuff in bulk out of fear they may discontinue it some day! Sheaffer I’m sure she meant High Impact. I also use it and love it. If you’ve never tried Bobbi Brown Smokey Eye Mascara, give it a go. It’s amazing and makes my lashes look so good. My friend I haven’t seen in a while thought I had extensions. Good stuff! I agree! For fall, there is a beautiful Voluminous burgundy color (looks like a subtle purple on) and a pretty blue – teamed with the Voluminous Primer, it’s even more amazing! But I would be remiss in not mentioning Neulash! I hesitated at having to spend that much, even on sale, but it does the trick. My short, stubby redhead lashes are sooo long now!! CHANEL Le Rouge Duo Ultra Tenue Ultra Wear Lip Color is my favorite lipstick/gloss! I can be flakey with products if they don’t deliver and this one is awesome. I’ve used it for over 5 years. My dental hygienist actually wanted to know what it was since it was so great about not coming off. She loves it too! I have dark hair and eyes and my favorite color is #48 soft rose. Nordstrom carries it. Sounds awesome! Thanks for the rec, Lindsay! well…………….. Conner did it again… 🙂 I ordered the skirt and 2 blouses.. can’t wait to wear them!!! Tell Conner thanks so much for the work wear posts!!! What brand/color is your nail polish in this picture? It looks like a dark purple. I love it! Also, any update on the static question? 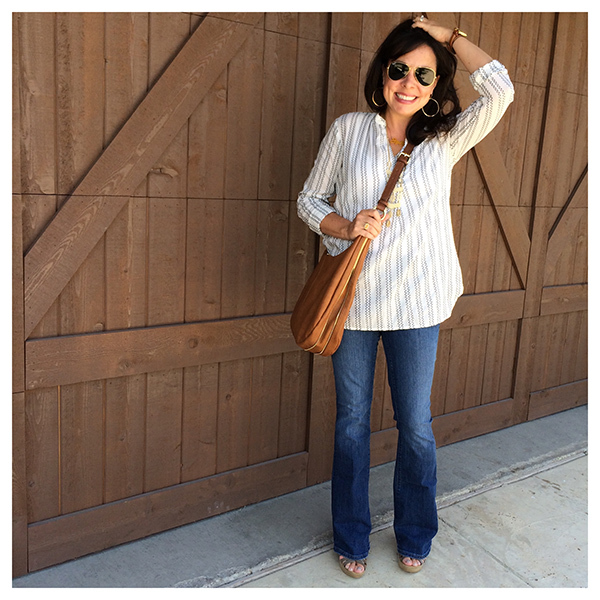 Love the workwear posts and her love for Loft! The coastal gray pants look like a true gray here but seem more bluish online. Do you know their true color? Thanks so much!